Find Out Here If Your Houston Church’s Stained Glass Need Restoration? Stained glass is a lovely strong material tinted with paints, pigments, and dyes to make it the perfect ethereal addition to churches, chapels, mosques, and synagogues. It is a wonderful adornment that should, when properly cared for–last a long time. However, simply because stained glass is durable, does not mean it will not eventually need repairs or a full restoration. The past tells us that church stained glass windows should be repaired or restored about every 80-100 years. It is around this time the lead caming, wood or steel frames, grout, and glass begin to wear down. If caught early and restored, it will be another 100 years before needing more repairs. If you are a member of a church that house vintage stained glass and you think it may soon need repair, review our guide below. 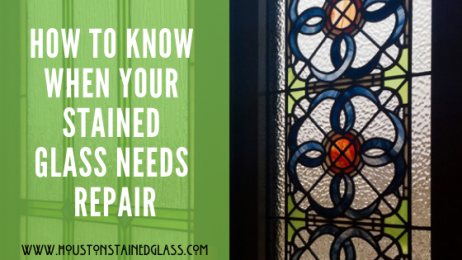 We have outlined a few surefire signs of disrepair to look for on your chapel’s stained glass that could mean it is time for a restoration, in order to keep it looking lovely and intact for the next generation of your congregation. A clearly visible sign that it is time to have a restoration done on your Houston church’s stained glass are gaps showing visible light through the frame, between the leading or glass pieces. No matter what the size of the gap, this type of wear and tear must be addressed because these gaps mean the lead is stretched and structurally unsound. It also means that the surrounding glass panels are no longer held securely in place. You risk a piece of glass falling out of the window therefore, a stained glass professional should be brought in to take a look. If the stained glass windows in your church are buckling, bowing, bulging or sagging, an actual collapse could be imminent. A worst-case scenario, of course, but not unheard of. Any falling glass is bad glass, as it were, because it could harm parishioners. It is not the glass that is failing in this situation but rather–the wood frame. After years of expanding and contracting over time the frame has lost strength and so too has the lead caming been stretched. This is an issue that needs to be repaired soon to immediately by a professional. The most common repair to church stained glass windows and not as pressing of a problem are the chips and cracks in the glass. Although not urgent, it does affect the beauty and luster of your church’s stained glass. However, cracks could also be an indication that the glass is under stress–mean the frame could fail. So, if you notice cracks getting bigger or increasingly popping up, contact a professional stained glass repair company like us at Houston Stained Glass.